There are so many sleepers who would rather make use of a flat pillow when sleeping on their beds. Different kinds of pillows offered in stores are suitable for those who prefer the big and fluffy types. But it’s very hard to get new pillows that come thin or less fluffy. Regardless of which you prefer, getting a suitable option with the dimensions comfortable for you is vital to getting deep and peaceful sleep. If you have ever had to deal with neck pain, it is usually due to the kind of pillow and the dimensions and thickness that might not be suitable for your body type. If your pillow is too high, it can push your head too far ahead and have a bad straining effect on your neck. You will probably wake up sore and stiff in your upper back, shoulder blades and neck and this pain will transmit through your back. To avoid this pain, sleep experts will tell you to use a pillow that gives your head, neck, and spine a neutral alignment and this means that your body will be able to rest in a horizontal frame. The pillow should cover the space between your neck and the mattress, this will help in keeping your head rested in a parallel and level position relative to the bed. Sleep experts will always advise that people who sleep on their stomach get a low profile and flat pillow. These types of pillows will help keep the head much closer to the mattress and prevent any strains on the neck. These experts will also advise you to make use of a higher or thicker pillow if you sleep on your side and for those who sleep on their back will be better off using a medium height pillow. Usually, people will have their own preferences on which pillow they find most comfortable, so when it comes to pillow dimensions, it is also very important to make decisions based on your own past experiences. 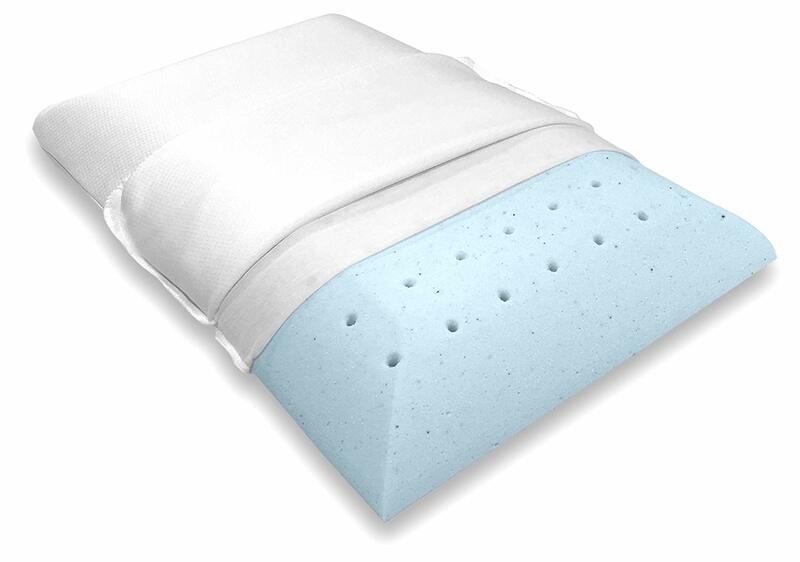 This Elite memory foam pillow is a very thin pillow that measures 2.5 inches in thickness. You might not find any pillow thinner than this one. 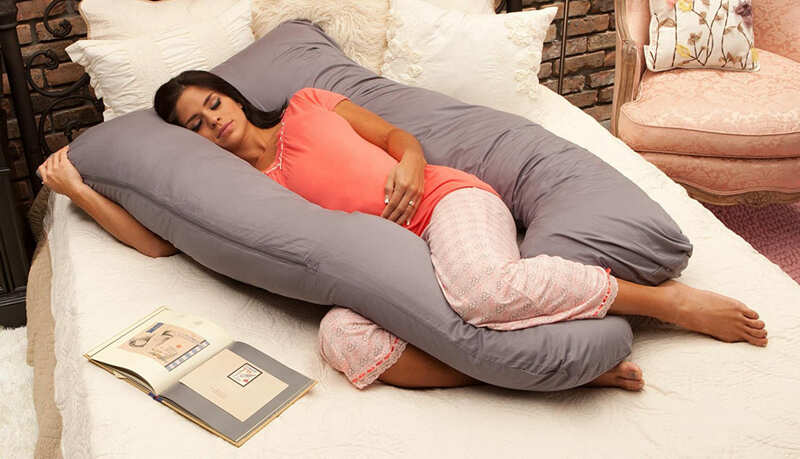 Due to its dimensions, this pillow is very good for those who sleep on their backs and stomachs. It is dual sided, one side with a slightly curved pillow shape and the other side just flat. 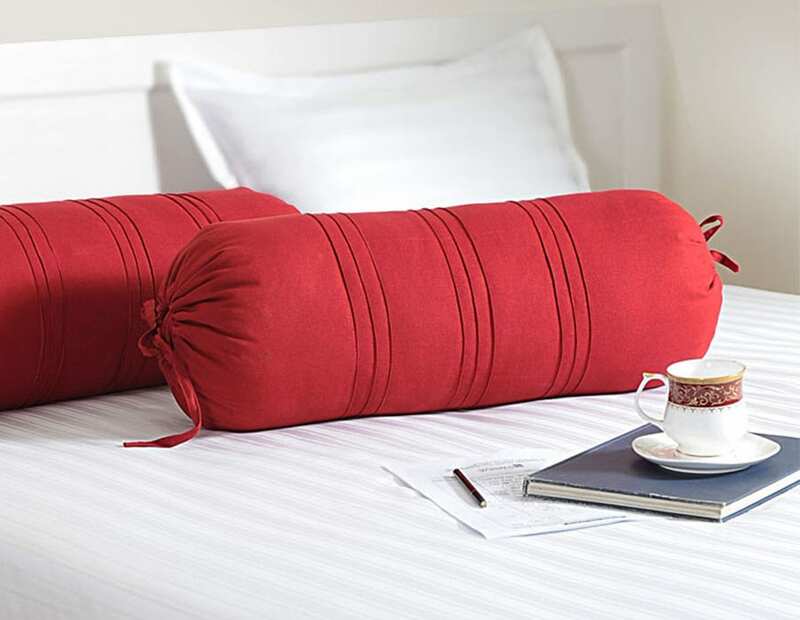 The pillow also has a cotton cover which is very soft and sensitive to your body. The memory foam offers you a deep softness and comfortability which conforms to your body type. 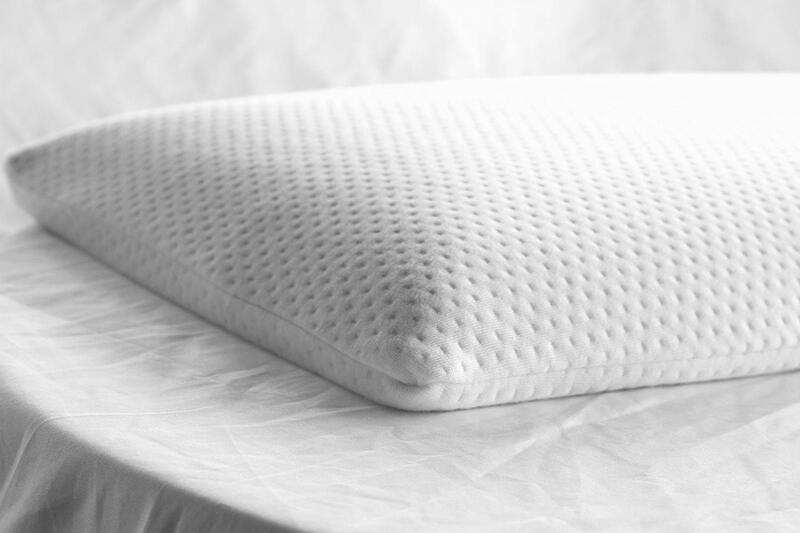 The pillow has hypoallergenic and antimicrobial properties and it is resistant to dust mites and bugs. This pillow should be a no-brainer for those who deal with pain in their neck and back many users have reported a reduction in pain in those areas after using this pillow. Very different from what you get with other shredded memory foams out there, this pillow isn’t adjustable and it is made specifically for those who sleep on their back and stomach. It is also good for smaller sleepers who sleep on their side too. Shredded memory foam has a lot of benefits over memory foam in general because it has a lot more breathability and contouring without any extra firmness. On top of this, it is also adjustable. This highly breathable pillow is quilted with a bamboo cover that makes sure you get the comfort you need on its resting surface. This allows for better circulation of air all around the pillow which ultimately keeps heat away from your body. It’s very thin profile is very good for supporting your head, neck and back if you sleep on those sides regardless of your body shape or size. Those who sleep on their stomachs too have also found this pillow very enjoyable. Unlike the typical memory foam products out there, this pillow is machine washable as a result of its excellent breathability. This helps to leave it as fluffed as possible without bunching up in any one area. The pancake pillow is very unique with an innovative design that offers the possibility of customizing your sleep experience regardless of what position you prefer to sleep in. 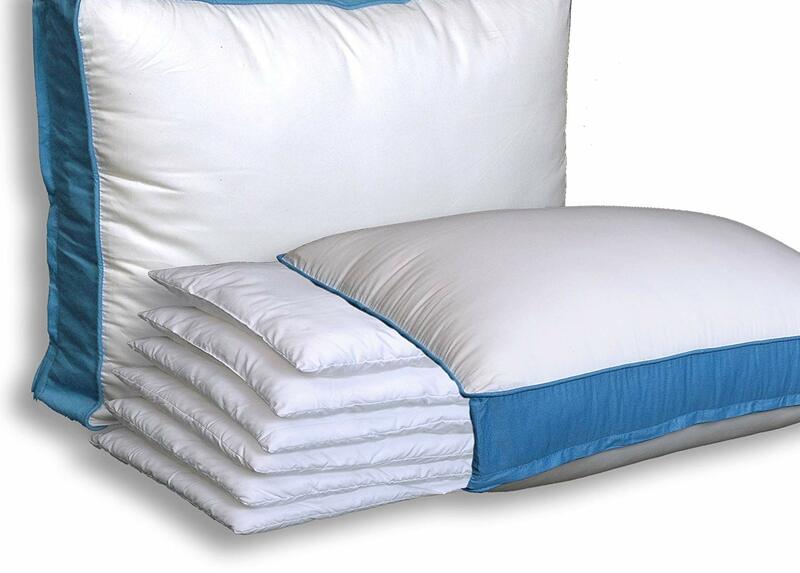 Due to its adjustability, this is a very suitable option for a flat pillow as all the pillows only measure 2 inches. They are very easy to remove or add depending on your preference. This is possible as a result of the zippered case that can be accessed along 3 of its 4 sides. Every layer is made with a soft density that can easily be compressed when layered to make for a firmer or softer sleeping experience. Your loft is also adjustable in case you are a side, back or stomach sleeper. Its hypoallergenic polyfill is a great alternative that spreads fairly easy to prevent it from lofting up around your head depending on how you sleep. This is an excellent option for any sleeping position, but it is most preferred for those who sleep on their backs because it offers the best support for your neck. Those who sleep on their stomachs will also find this pillow enjoyable even though the fewer layers make use of less firm support. This pillow is advertised as being expertly made with a plush and gel fiber filed structure which offers excellent airflow and breathability. These characteristics are as a result of the gel-filled fiber that doesn’t retain any heat. The fixed filling is also a good touch because it moves and offers support wherever it is required without bunching up even after you wash it. This pillow dimension is average to flat loft and it is considered a more plush feel instead of firm. It might not give you the best support if you sleep on your side but it is a good choice for those who sleep on their back and stomach. Plush surfaces are described as a surface that has a soft feel but without trading off the underlying support. The general structure of this pillow is that of material properties which give it a cooling effect and an overall comfortable design that really does draw your attention. This pillow is a popular option for flat pillows. The Bluewave bedding ultra slim pillow is infused with a memory foam gel that draws heat from your body via the process of conduction. This will give you the cooling sensation you desire. It is a very popular choice with memory foams. This is because the foams easily create a form of heat sink around you. Made for those who sleep on their backs and stomach, this pillow will keep your neck fully supported when you need it, and it also gives you soft contouring for relieving pressure. This pillow is very good for those who sleep warm and those who sleep on their backs in need of proper alignment of the spine. Those who sleep on their stomachs will also prefer it to a lot of alternatives in the market. This pillow is not the best for those with smaller bodies as it may raise their heads a bit too high. This pillow is excellent for babies. It is designed specially to suit toddlers and measuring only 13 by 18 inches, it is excellent for children aged 2 and upwards. The pillow strikes a perfect balance between flatness and fluffiness. It offers the perfect amount of support for your toddler’s head, neck, and spine. It is constructed from 100% organic cotton material thus it is certified free of any chemical content. Made from 100% organic cotton and certified free of any chemical content. The product also is made with antimicrobial and hypoallergenic properties. It is also resistant to dust mites and bugs. The fiber is easy to wash and doesn’t get any lumpy after washing. It has a cover made from fine and soft cotton. In order to keep in a natural and healthy position during sleep, the thickness of the pillow is very important. There is a clear correlation between pillow dimensions and support offered in alleviating neck and back pains. If you sleep on your stomach, you often put your neck in awkward position. When you also sleep on your back, your neck should be close to the mattress. This you can achieve with the help of flat pillows that will help place your head and spine aligned. Therefore making use of these flat pillows will prevent your head from being in strange positions thus alleviating stress in the neck and spinal regions. With this setup, you also get to reduce your headaches, dizziness, and insomnia and you can recharge yourself with invigorating sleep. For those who sleep on their side, they may prefer thicker pillows. These thicker pillows are more suitable since they fill the space between the ear and the shoulder. Thin pillows help in the reduction of facial wrinkles. Sounds unbelievable but it is true. The idea is that the large and bulky pillows will actually squish your face in some areas and the soft and thinner pillows will help you avoid this issue. The normal pillows are meant for adults and they are not usually suitable for toddlers. You have to understand that the body of a baby is different when compared to that of an adult. As a result, babies and toddlers require a specially designed pillow that is optimized for comfort. Their neck is more sensitive compared to that of adults. Thus, a toddler pillow is made to suit the proportions of a baby and meet their own specific needs. 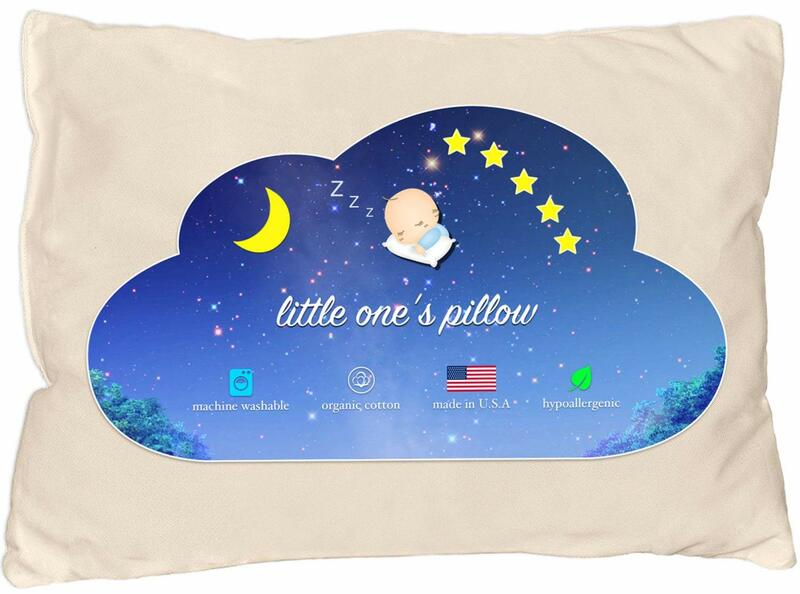 These pillows will make your babies sleep more comfortably all night without any strain on their necks or shoulders. There are a few things you must realize before you go out to buy yourself a flat pillow. The first of which is the position in which you sleep. Your budget is another and how warm you sleep is another. These factors are very important so let’s look into each one of them individually. Flat pillows will be great for those who sleep on their back and it is almost a requirement for any front sleeper. Where do you fall? You may be the type who tosses and turns a lot moving from one position to another. Flat pillows are made to offer support with a low loft. The average pillow will have about 3 inches of loft. Depending on the fill in the materials and the nature of compression, you can find thicker 3-inch lofts going as high as 6 inches. But once the wright of your head and neck is placed on them, they tend to collapse a little. Typically, this is good for those who sleep on their front, the pillow can billow on the edges where you will turn your face. This can make breathing a little stressful. For those who sleep on their backs, a high loft, high compression pillow will make the head fall backward and this puts stress on your spine and compacts your vertebrae in the neck region. Due to this, if you are reading this and you turn out to be a side sleeper, you must get a different kind of pillow. There are various other soft pillows and contour pillows that will be more suitable for you. These kinds of pillows will be more beneficial to you in the long and short terms. You might not expect that your budget will be a deciding factor in this, after all, you are just buying a pillow right? You should understand that flat pillows are special kinds of pillows and the higher quality ones with very cool features will set you back a considerable amount of money. Preparing your budget accordingly will help you get the most suitable pillow for you. If you sleep warm, you may find some relief in a flat pillow. To keep compression high and loft lower, the materials utilized in making flat pillows are very conducive for hotter sleepers. It is a general practice that if you make use of a thin pillow, it will not breathe and circulate air as much as others will. This will make the pillow hold on to more heat on your body without dissipating it, and this makes you get hotter. In well ventilated and temperature regulated rooms, this is not usually the case, and you should factor this into account. Be it flat or thin, pillows are usually down or feather types. They don’t give you as much support, but they allow back sleepers a layer of comfort between their head and the bed. 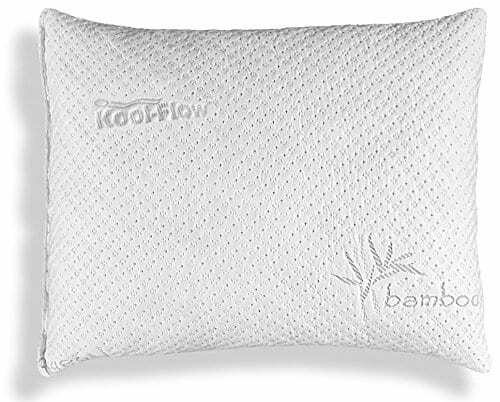 As of today there a variety of materials to pick from ranging from bamboo to memory foam is used in making thin pillows. Some will function better than others, so you need to decide on which is best for you. 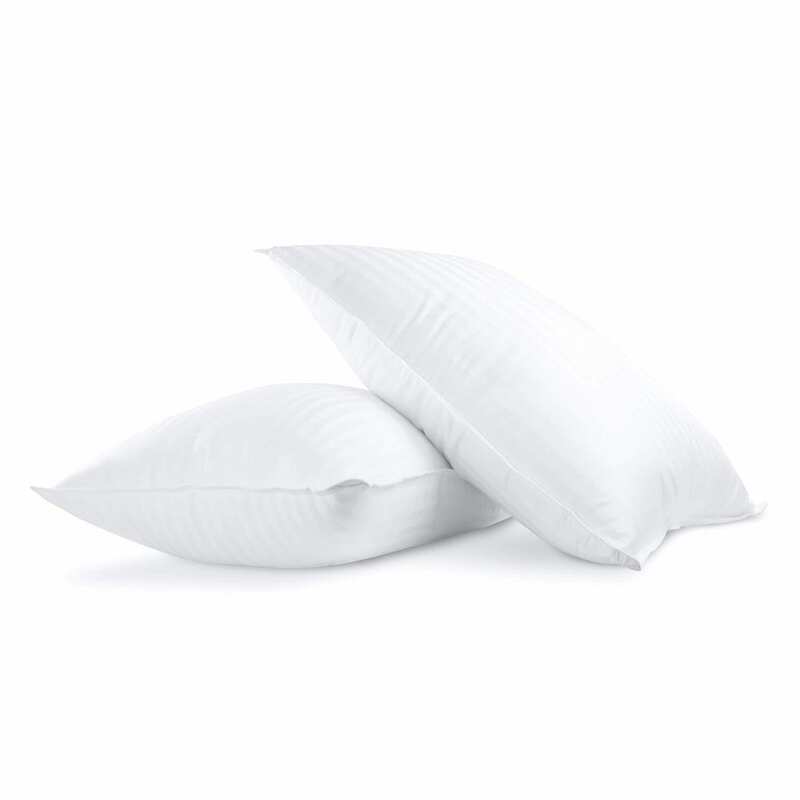 When you lay your head and shoulders on the pillow, you only experience about a quarter to half inch loss in compression with many of the flat pillows out there. The downside to this is that if you sleep on your stomach, you can sometimes find it to be a little stiff. Cotton is not the best cover material because it wicks moisture from your body. You can solve this problem with a satin pillowcase. With cotton covers, you get some amount of airflow and heat distribution. In conclusion, the choice of pillow is a very vital part of your health and thus making sure you choose one that supports your spine as regards how you sleep shouldn’t be taken with laxity.